Neanderthal Skull. 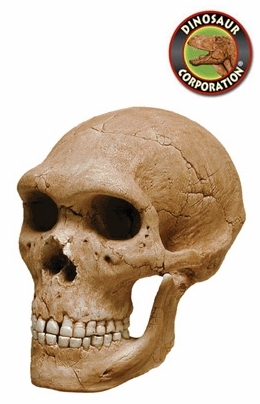 Dinosaur corporation is proud to present these beautifully crafted hominid skulls. Sculpted by master sculptor Steve Pinney, these full scale museum quality replicas capture all the detail and grandeur of the originals. Neanderthal, is an extinct member of the Homo genus that is known from Pleistocene specimens found in Europe and parts of western and central Asia. Neanderthals are either classified as a subspecies of humans (Homo sapiens neanderthalensis) or as a separate species (Homo neanderthalensis). The first proto-Neanderthal traits appeared in Europe as early as 600,000 - 350,000 years ago. Proto-Neanderthal traits are occasionally grouped to another cladistic 'species', Homo heidelbergensis, or a migrant form, Homo rhodesiensis. By 130,000 years ago, complete Neanderthal characteristics had appeared. These characteristics then disappeared in Asia by 50,000 years ago and in Europe by 30,000 years ago. The youngest Neanderthal finds include Hyaena Den (UK), considered older than 30,000 years ago, while the Vindija (Croatia) Neanderthals have been re-dated to between 32,000 and 33,000 years ago. No definite specimens younger than 30,000 years ago have been found; however, evidence of fire by Neanderthals at Gibraltar indicate that they may have survived there until 24,000 years ago. Modern human skeletal remains with 'Neanderthal traits' were found in Lagar Velho (Portugal), dated to 24,500 years ago and interpreted as indications of extensively admixed populations.